Robert Parker, Parker’s Wine Buyer’s Guide (New Edition 1989-1990). Simon and Schuster, 1989. Our friends were married in 1989 and recently celebrated their silver anniversary with a dinner party where almost all of the wines were 1989s from their cellar (plus a few bottles from their children’s birth years). What a treat! I’ll paste a photo of some of the wines we enjoyed at the end of this post to give you an idea of what a great time we had. To paraphrase a famous football coach, wine isn’t like life, it is life, so wine and life’s celebrations are natural partners and our very small gift to the happy couple was an autographed copy of the 1989 edition of Robert Parker’s Wine Buyer’s Guide. I hope that what the book says about how wine has grown and changed over the last 25 years will inspire them to consider how their relationship has deepened and matured like a great wine! I couldn’t part with the book without looking at it myself — just a quick glance to see what Parker wrote about and how — not the detailed analysis of the individual winery and wine entries that would yield the greatest insights. Here’s what I found. What’s changed since 1989? Well, you won’t be surprised to know that prices have done up. Parker rates each wine with a point score out of 100 (his signature rating system) and an alphabetical price indicator. A = Inexpensive (less than $8) to E = luxury (in excess of $50). The 1984 Ridge Monte Bello Cabernet Sauvignon receives 96 points and a D ($25-$50) for example. The Heitz Martha’s Vineyard Cab cost only C ($15-$25) — I should have put some of that away! It is interesting to see how the world wine map has broadened in 25 years. The sections on the Wines of Western Europe is very complete, as you would expect, with France, Germany, Italy Spain and Portugal well represented. A section on The Best of the Rest includes Australia (of course), and briefer discussions of Argentina, Bulgaria, Chile, Greece, Hungary, Lebanon, New Zealand, Switzerland, the UK and Yugoslavia. It would be hard to make a list like this today without including Austria, South Africa and China. Brazil, India, Israel and several other countries would also claim a place in the lineup. What about North America? Well it is there, of course (sans Canada, alas), wedged between Europe and the Rest, with about 250 pages of text compared to nearly 550 for Europe. That’s not a bad page count ratio when you consider how much more wine the Europeans produced then and how tiny the US industry was by comparison. California got 210 of these pages followed by Oregon with about 30 pages. Parker has a particular interest in Oregon wines and is a partner with his brother-in-law at Beaux Frères (Parker does not review these wines because of understandable conflict-of-interest concerns). I was interested to see what Parker had to say about Washington wines back in 1989, so I turned quickly to the chapter on Other American Viticultural Regions (other than California and Oregon that is). Connecticut, Idaho, Maryland, Massachusetts, Missouri, New Jersey, New York, — the list goes on, wine seems to be everywhere in America — Ohio, Pennsylvania, Rhode Island, Texas, Virginia and then finally Washington! “While I still have doubts about the overall quality and potential for Washington state wines,” Parker writes on page 843, “there are some encouraging signs …”. Not exactly a ringing endorsement, but probably how many wine people saw the situation at the time. California was obviously important. Oregon, too, because of its Burgundy-like prestige. Washington? Still needed to prove itself, which I think it quickly did. Washington is now the nation’s #2 wine producer in quantity and challenges California in many areas in terms of quality and reputation. But not in 1989. In a very brief guide to the state’s best wines, Parker found no Outstanding Chardonnays and just one excellent producer (Hogue). Arbor Crest, Columbia, Chateau Ste Michelle and Zillah Oakes made the cut as Good Producers of Chardonnay. The best Cabernet Sauvignons? Chateau Ste Michelle’s post-1983 Reserves earned them an Outstanding recommendation. The Chateau’s regular bottling was rated Excellent along with the Columbia “Red Willow” Cab and wines from Latah Creek, Leonetti and Woodward Canyon. Six wineries received the Good score, including Quilceda Creek, which is since earned cult wine status. While we know that Parker thought the 1985 Pinot Noir Reserve from The Eyrie Vineyards in Oregon was worth an 89 score and cost a C amount, we have no numerical rating or tasting note data on any individual Washington wine at all. Much has changed since 1989 as Parker’s book makes clear, but a lot has stayed the same, too. 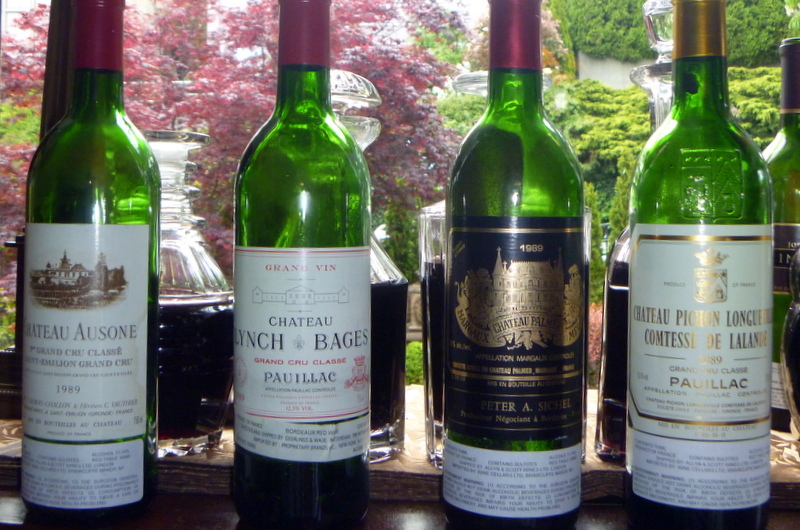 Many of the great wine producers of the world have aged and developed as gracefully as the 1989 wines we had with dinner. New wineries, regions, styles and varieties have emerged. Wine was great in 1989, as Parker’s guide tells us. It is even better now, don’t you think! Thanks for your comment, Jim. I have not visited the Finger Lakes region recently and so I have not written anything of substance about them. I have, however, tasted many wines from this region at the last several Riesling Rendezvous meetings and I am a very big fan. Thanks again! As an Australian looking at this, the reviews that RPJ gave to Australian wines really set the mold for the style produced with the hopes of export success in the US market place. The trend of bottling highly extracted 15% + alcohol Barossa Shiraz in the hope of standing out and winning Royal Society trophies and garnering high Parker points was seen as the formula to success. Now that Bob no longer reviews Oz for the trade we are seeing a dynamic evolution in regional styles, many of the young guns are bottling their wines using whole bunch and carbonic maceration producing “Nouveau Shiraz” styles. Something that Parker would have likely scoffed at- yet the local market adores for their versatility with our cuisine.